With less than a week to go until the Copenhagen Beer Celebration, I thought to relax after lots of bicycling around today I should really get stuck in to one of those Mikkellers I’ve been stockpiling. 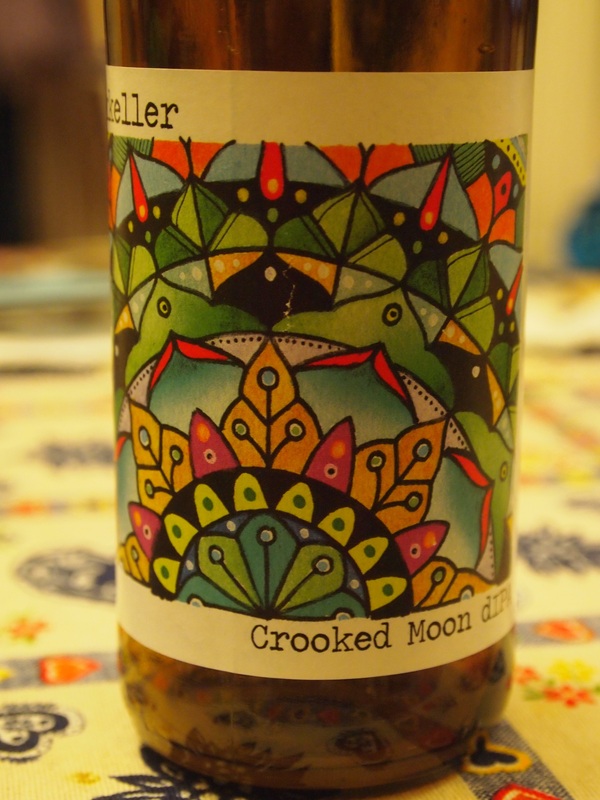 After a day of changeable weather I was instantly drawn to the beautiful sunshine bright label of the Crooked Moon (9%ABV). We’re all familiar with Mikkeller’s tendency to collaborate with the world’s finest brewers, but this is actually a beer he brewed with the Swedish tattoo studio Crooked Moon to celebrate their first birthday.Even if you’re not a fan of tattoos, it’s totally worth visiting their website to see their incredible artwork. The two brothers running the show, Jacob and Jonas, each designed their own label – I chose the more colorful one designed by Jonas. It’s a ‘violently hoppy’ double IPA and uses pretty much all of the current favorite hops. There’s amarillo, citra, nelson sauvin, simcoe and sorachi ace. The result is a cloudy sunrise orange cocktail of fruitiness which bursts with aromas of lemons and pineapple cubes. There’s more of that beautiful sweet pineapple in the flavor garnished with a wedge of lime and offset by a super-dry bitterness. It’s like a keylime pie topped with exotic fruit and packed with sunshine – a pretty awesome birthday celebration drink!